(L-R) Angelika dela Cruz, Sunshine Dizon, and Angelu de Leon talk about Pinoy Teleseryes: Then and Now. The production of Philippine teleseryes has come a long way. Loyal viewers of Pinoy teleseryes can attest to how a TV show can rate or flop depending on its production values: story, flow, editing, characters, settings, and technical strength. In the first installment of the "Anatomy of a Pinoy Teleserye"—a special report in PEP.ph (Philippine Entertainment Portal)—we sought the expertise and views of business unit heads. For this second installment, we take a look at how Pinoy teleseryes have evolved from the '90s to the present, through the eyes of three actresses who have been starred in many television series since they were young. Here are three of GMA-7's original teleserye leading ladies: Sunshine Dizon, Angelu de Leon, and Angelika dela Cruz. Each of them became go-to stars in the Kapuso network’s drama department, after top-billing their own TV shows. Sunshine Dizon was a movie child actress in the late '80s before she was tapped to be one of the lead stars in VIVA Television's weekend series, Anna Karenina, with Antoinette Taus and Kim delos Santos. The show was such a hit in the '90s that it ran for almost six years, from 1996 to 2002. Following that, Sunshine was groomed to be the Kapuso Network’s drama princess, and went on to headline various GMA teleseryes—easily playing the bida or the kontrabida. Angelu de Leon started her career in 1994, as part of the ABS-CBN youth-oriented gag show Ang TV, but it was in VIVA Television and in GMA-7 where she was given her big break. In 1995, she was tapped to lead a bunch of newbies in the youth-oriented series, TGIS. The other newbies were Raven Villanueva, Michael Flores, Bobby Andrews, Rica Peralejo, Red Sternberg, Ciara Sotto, and Onemig Bondoc. The show was so phenomenal that Angelu and her screen partner, Bobby Andrews, were assigned to top-bill one more teleserye and five movies. Angelika dela Cruz started her career when she was introduced in the 1996 film Nights of Serafina. She was then discovered by ABS-CBN bigwigs, who included her in the drama shows Mara Clara and Esperanza. 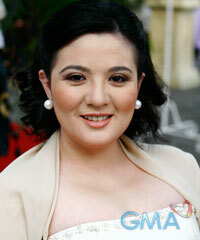 In 1999, Angelika transferred to GMA-7, where she went on to top-bill her own teleseryes. Her 2001 drama series, Ikaw Lang Ang Mamahalin, started the Kapuso network's more earnest and consistent production of teleseryes, which would eventually be part of its prime-time block programming and come to be known as GMA Telebabad. Fast forward to today, 2019. The three actresses have remained active in showbiz, and are still tapped to play major roles in teleseryes. Currently, Sunshine, Angelu, and Angelika play major roles in GMA-7's afternoon drama series Inagaw na Bituin, which seems to be a modern take on the traditional drama fare that viewers have seen over the years. Definitely, Sunshine, Angelu, and Angelika have been witness to how the television landscape—especially in the genre of Pinoy teleseryes—has changed since the '90s to the present time. After all, they have served as frontliners for the TV series whipped up by the two giant networks, ABS-CBN and GMA-7. PEP.ph’s "Anatomy of a Teleserye" comes in three parts, with each part digging deep into the experiences of Sunshine, Angelu, and Angelika in the teleseryes they've been part of. For this first installment, Sunshine, Angelu, and Angelika give their observations on how storylines and confrontation scenes have evolved, and how viewers have been accepting these changes. Sunshine, Angelu, and Angelika also look back on the hurdles they experienced while doing their own teleseryes—especially when it comes to unforeseen events like untimely pregnancies, illnesses, and even personal feuds. When it comes to the evolution of the Pinoy teleserye, Sunshine recalls a conversation she had with teleserye creator RJ Nuevas, who has been writing teleseryes since the late '90s. RJ is the creator of earlier series on GMA-7, such as Villa Quintana (1995), Sunshine's Anna Karenina (1996-2002), and Angelu's Ikaw Na Sana (1997-1998). Sunshine recalls, "Few years back, tinanong ko na rin 'yan kay Kuya RJ. Sabi niya, parang, I forgot kung three years ba or five years, but it's usually parang a certain period of drama, and then iikot na naman 'yan, fantasy na naman." However, about today's TV series, Sunshine says, "Parang ang hirap na i-predict." She observes: "Hindi na nagbe-base ngayon sa kung sino yung bida. "May iba, it's really more of the story that they're really after. May iba naman din, I think it's really more of the quality. Parang hindi na ngayon kung sino yung bida. "Kasi ang dami na rin naman na you'd expect it would be a big hit, but, unfortunately, nagpa-flop." What is important, says Sunshine, is that today producers think of ways to cater to viewers' interests, especially at a time when streaming sites give more options. "So I think it's really the story now, how you hook the audience into, parang, in their busy schedules, 'Bakit ko ito dapat panuorin?' Ang dami ng options, so the story has to be something that will catch your attention and interest." Angelu believes that the viewers's thoughts about what they are watching have also changed. This, according to her, is evident in scenes that have become viral, or TV shows that have been rating so well. 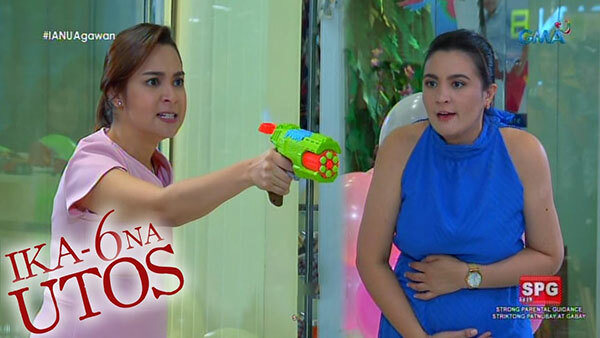 She specifically refers to the nerf gun scene of Sunshine's afternoon series, Ika-6 Na Utos, which became viral during its run. Angelu says, "Then it was more natural—the acting, the storyline, parang mas madaling makibagay sa story. Ngayon kasi, over-the-top. "Di ba, pag napanuod yung mga nagba-viral? It's visually over-the-top. "It's visually overacting, pagdating sa linyahan, pagdating sa acting minsan, pagdating sa props, pagdating sa kuwento, maraming ganun. "Ngayon, I think, na-realize na ng audience na it's all entertainment. So, the more entertaining it is, the more naka-capture yung audience. Iba na yung scope talaga ngayon ng audience." Angelika is happy with how TV networks have become risk-takers, pursuing stories that were once impossible to see onscreen. That is aside from the improved technology, where producers and directors use high-tech cameras and lighting. Angelika explains, "Yung technicality, mas maganda na siya, e. Mas maganda siyang panuorin kasi siyempre mas high-tech na yung mga gamit. "Tapos mas malawak na ngayon, e, the stories that we tackle. "Hindi na siya yung kagaya dati na paulit-ulit lang: api—may nang-api; api—may nang-api. "Ngayon, parang sa GMA, nata-tackle na rin natin yung mga stories ng LGBT, which is maganda. Kasi inaabangan ng tao yun, e. Something new, at saka yung may laman. "Kasi yung before, parang takot sila i-tackle yun sa Philippine television. So ngayon, na-a-appreciate ko yung nata-tackle siya nang ganun." This, according to Angelika, also serves as an advantage for actresses like her who look for something different in the roles offered. She continues, "Mas malalim ngayon compared to before, kasi mas malawak na yung range ng mga role na ginagawa ko. "Before kasi, noong bagets ako, iisa lang yung peg ko, e—laging inaapi, laging inaapi. "Ngayon, iba naman siya, minsan nang-aapi, pwedeng inaapi, minsan gray yung character. "So, mas malawak na yung range na nagagampanan ko, which is for me mas exciting, siyempre, di ba? Kasi mas may challenge. Hindi ka nakakahon." Angelika also points out that teleseryes are now being exported worldwide. "Ang maganda rin ngayon, pinapadala na yung mga shows natin abroad. So, mas marami ng taong nakaka-appreciate noong mga pinaghihirapan natin dito. "Ngayon talaga, kailangan pagandahin kasi ipapadala ito abroad, makikita ito ng ibang bansa. Siyempre, kailangan, yung standard nila, kaya nating pantayan o higitan man lang, di ba?" Pinoy teleseryes are known for for their confrontation scenes between the bida and the kontrabida. These confrontation scenes have also evolved through the years. Before, actors seemed to only engage in hair-strangling and face-slapping catfights. Now, "weapons" are also used to make the scenes more iconic, entertaining, and viral. Dialogues have been already fierce in the '90s, but they have become more quotable and entertaining now. Sunshine and Angelika, who have been doing confrontation scenes with each other since their Umulan Man O Umaraw (2000) days, have witnessed how these scenes have evolved. In Mundo Mo'y Akin (2013), Perlita (Sunshine) almost "charred" Giselle’s (Angelika) face by shoving it in a barbeque grill. In Ika-6 Na Utos, Emma (Sunshine) slammed the face of Geneva (Angelika) on a photocopying machine and even produced xerox copies of the latter’s face. Sunshine is happy that writers are able to give a new flavor to confrontation scenes. "E, di bongga, buti naman. Mas nakakahiya naman kung hindi mag-evolve, di ba? Parang kakulangan ng writer yun pag hindi nag-evolve." Confrontation scenes in current teleseryes have looked more outrageous, but as far as Angelika remembers, "Dati, ang sampal, gusto totoo, e."
Sunshine echoes, "Yes, dati, bawal daya. Ayaw nila ng daya. "Pero, nasa sa 'yo yun kung magaling kang tumayming ng iwas at magaling kang mag-react. "Kasi, kapag medyo bano yung reaction mo, masasampal ka talaga! Yun lang naman actually yun." That is why there is no more problem between Sunshine and Angelika when it comes to their sampalan scenes in Inagaw na Bituin. Sunshine says, "Wala, sanay na sanay na kami. Wala na." Angelika puts it this way, "Para ka lang sumasayaw." According to Sunshine, confrontation scenes only become a concern when "may ka-eksena ka na medyo bago." The reason for this, she says, is, "Pag medyo bago, asahan mo nang may masakit humawak o madadali ka." In Inagaw na Bituin, Sunshine and Angelika have already done fight scenes. Angelu, who has her own share of catfight scenes in the show, is no stranger to confrontation scenes. This is from her '90s teleserye, Ikaw Na Sana, where she engaged in fight scenes with Gladys Reyes. One of the scenes involved Gladys nearly submerging Angelu’s face in "umaapoy na kalan" with a pot of boiling water. Angelu later avenged herself and slathered mashed tomatoes and onions on Gladys's face. The TGIS actress believes that harmony in the workplace, despite these intense scenes, truly happens if all actors are professional. "Actually, wala kang magiging problema kung alam mong yung kasama mo, professional din. I mean, you won't take it against them. "If you take it personally, actually, ikaw yung may mali. "Kasi, basta hangga't rumo-roll yung camera, it's all professionalism. Kapag hindi na rumo-roll at may ganun pa rin, e, di, at saka tayo mag-usap sa presinto, parang ganun. "It's always... there are two sides always, and you always have to have that boundary of respect as an actor. "Mas okay pa yung ganun kaysa yung nambibigla, yung nang-iisa, yung parang ganun ang feeling..."
Angelika seconds this strongly, "Yung wala sa script, sasampalin ka—ayoko no'n!" There are really situations when one can get hurt in a confrontation scene, but these happen unintentionally. Angelu recalls what she witnessed on the set of the GMA teleserye Sana Ay Ikaw Na Nga. "Hindi naman sa akin nangyari, pero naalala ko, si Tanya Garcia at saka si Nanay Elizabeth Oropesa, nagsampalan sila, 'tapos dapat fake lang. "E, nagkamali ng blocking si Tanya, tumama [si Nanay]. "Umikot talaga yung mundo niya. 'Tapos talagang for a time, ayaw na niyang mag-taping! "Sabi talaga ni Tanya, nakakita talaga siya ng stars. 'Tapos, iyak lang siya nang iyak. "So, nangyayari yun, but at the end of the day, as long as after nun, mag-apologize kapag may nasaktan, then that's fine." Angelika also had her own experience with Elizabeth—often called "La Oro" in showbiz—on the set of ABS-CBN’s Esperanza. The mention of this prompts Angelika to exclaim, "Ang lakas manampal ni Tita Oro! Angelika recalls, "Alam mo, Esperanza days, nasampal niya ako. "Nakalimutan ko kung saan ako e-exit, nagkamali ako ng exit!" As for Sunshine, who's used to slapping faces since her Anna Karenina days, she makes sure that her castmates are aware that "mabigat ang kamay ko." Which is why, she says, "As much as possible, dinadaya ko talaga. "Pero, kapag sinasabi nila na okay lang, gusto daw nilang totoo... usually, after one, ayaw na nila!" Angelu chimes in, "Dapat, kapag si Shine ang kaeksena mo, magaling ang director, para one take lang." Sunshine recalls a scene she did with Albie Casiño for the 2018 Metro Manila Film Festival Best Picture Rainbow's Sunset, with Joel Lamangan as director. "Pag kay Direk Joel, babalikan pa ako. Parang ito, sa Rainbow's Sunset. Parang feeling ko, natulala yung guy. "Parang natulala si Albie ng mga ilang seconds, tapos pagka-cut daw, paglabas, sabi daw niya sa face, gumanon daw," Sunshine says, putting one hand on her face. She continues, "Sorry, Albie! Nautusan lang ng director. Ako ay masunuring bata. "Pero, mabigat talaga ang kamay ko. So, sinasabi ko naman. "As much as possible, I'd rather daya na lang. Pero kung talagang sabihing, 'Ay hindi, totoo!' E, sorry, trabaho lang." The most common problem a TV show encounters is when an actress—especially its lead—becomes pregnant in the middle of a series run. How producers and networks deal with this kind of crisis was discussed in the first installment of PEP.ph's "Anatomy of a Pinoy Teleserye," particularly in the separate situations of Marian Rivera in The Rich Man's Daughter (2015) and Kylie Padilla in Encantadia (2017). But perhaps the earliest instance of this kind of crisis was Angelu de Leon getting pregnant in the middle of doing the youth-oriented series, Growing Up, the spin-off of TGIS. At the time she got pregnant, Angelu's love team with Bobby Andrews was at the height of its popularity. Angelu eventually chose to leave the show and end her stint in the Kapuso show. This was also the reason why she was replaced by Carmina Villarroel in the prime-time series Ganyan Kita Kamahal. It was supposed to be Angelu’s follow-up teleserye with Bobby after Ikaw Na Sana. Angelu first opened up to PEP.ph about this during her July 2015 PEPTalk interview, where she explained why she chose not to see the final episode. She says, "Siguro, yun yung hurt ko, in a sense na, not just because of what I did, but it’s because of what I did to people who were part of Growing Up. "Parang, I didn’t have the courage before to apologize to them. 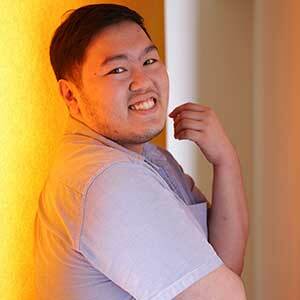 "I didn’t have the courage to… parang that time kasi, when I left, I was all just full of pride. "Parang ganun, parang umalis ako dahil, 'Kaya ko 'to, paninindigan ko ito, paninidigan ko yung ginawa ko.' Ganyan!" Looking back, Angelu says she could have handled the situation better. "Siguro, if I handled it with more humility and with more compassion towards other people, it would have been a different scenario, parang it would have been maybe easier. "Pero kasi, I handled it with so much pride. "Kasi dati, ang uso dati, parang kailangan maging malakas ka, kailangan ipakita mo sa tao na matapang ka. "Which is nakakalimutan ng tao na, I think, more than anything, if you've committed a mistake, it's to humble yourself first, then you become stronger." Angelu says she has since watched Growing Up's series finale. She tells PEP.ph during this interview that she still had hesitations about watching it, but she did anyway. "Isa siya kasi doon sa may what if, e—sa akin, sa mga audience namin, meron siyang malaking what if." Still, Angelu has no regrets about choosing her child over finishing the show. She goes on, "At the end of the day, it still felt that it was just that. It needed to be that. "Sa mata ng mga tao, sa buhay ko, it needed to be just that. And at the end of the day, you're just grateful that it happened in your life and not think that, 'sayang,' di ba? "Would I have given up my child just to end a series? Parang hindi rin siya tama." Despite the hurdles, Angelu successfully pursued a showbiz comeback in 2000, top-billing the VIVA TV-produced drama series, May Bukas Pa, along with Anne Curtis, Kim delos Santos, Dina Bonnevie, and Cherie Gil. In 2008, Angelika dela Cruz also faced the same situation. The only difference is that, she did not know she was pregnant while doing not only one but two shows. 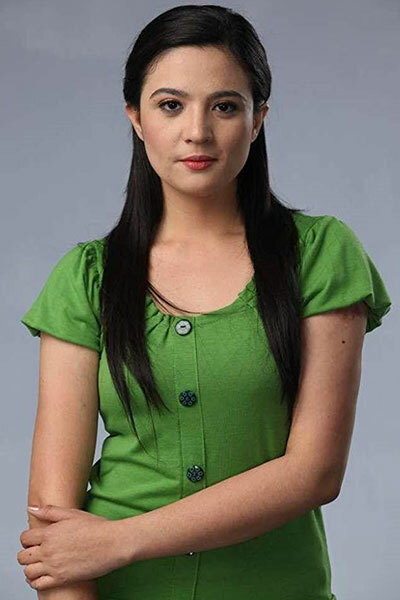 First, she was doing the afternoon series, Una Kang Naging Akin, which also starred Maxene Magalona and Wendell Ramos. It was a remake of the 1991 movie starring Sharon Cuneta and Gabby Concepcion, where Angelika breathed life to Dawn Zulueta's movie character. She says about the show, "Ang role ko doon, role ni Dawn Zulueta sa movie. Supposedly, baog ako doon sa show na yun. "Yun ang conflict kaya nagkagulo-gulo yung marriage nila at first. "'Tapos, while doing the show, laging sumasama pakiramdam ko, nagsusuka ako. Buntis pala ako! Hindi ko alam! "Hindi ko alam na buntis ako kasi walang symptoms, e. Hindi ako naglihi o ano, 'tapos biglang noong isang taping day, nagsusuka ako. "'Bakit? Anong nakain ko?' Tapos kain ako nang kain, ang lakas-lakas ko kumain, gutom na naman ako? Yun pala, buntis." While doing Una Kang Naging Akin, Angelika was also seen in the prime-time series LaLola. LaLola's production team was able to cope with the situation. She recalls, "Dapat supermodel yung role ko. So yung mga eksenang rumarampa, ganon, palaging may hawak. Kasi ang laki na ng tiyan, e. Kailangang itago!" However, the pregnancy became a dilemma for Una Kang Naging Akin. During that time, it was the concern of production, especially director Joel Lamangan, to hide Angelika's growing tummy. Angelika continues, "E, siyempre, matagal yung show. Yung mga show naman noon, hindi kagaya ngayon na saglit lang, di ba? Hanggang sa lumaki na yung tiyan ko. "So laging ano namin noon, paano itatago yung tiyan?" "Yung mga ganun, considered crisis na rin, e, sa production. "Sabi ko, 'E, anong magagawa ko?' May la mesa, nakaharang sa tiyan." When her pregnancy became obvious, that was the time the producers decided to end Una Kang Naging Akin's run on its sixteenth week, the normal one-season run of a GMA-7 afternoon show. She continued to do LaLola, where adjustments could be made with her Sabrina Starr character. "I think, sa LaLola, mag-e-eight months na ako. Binuntis na lang ako kasi talagang wala na. "Si Sabrina Starr, hindi na kering maging model kasi malaki na! Binuntis na nila yung role ko." Sunshine Dizon had illness as reason for her getting pulled out of two TV shows she was supposed to top-bill in GMA-7's afternoon block. In 2008, she was supposed to headline the afternoon series, Gaano Kadalas Ang Minsan?, with Marvin Agustin and Diana Zubiri. She was supposed to reincarnate the role first portrayed by Vilma Santos in its 1982 movie version. Sunshine already did a pictorial and taped the pilot week for the series. It was later announced that she had been dropped from the cast. She was replaced by Camille Prats. This happened again in 2009, when she was doing another afternoon drama, the remake of Tinik sa Dibdib. Sunshine portrayed the role first played by Nora Aunor in the 1985 movie. The case in that show was different: Tinik sa Dibdib was already airing when she had to leave the series. Writers then did their magic: Sunshine's character was made to ride a bus that exploded, causing her to undergo plastic surgery. In the next episode, it was already Nadine Samonte playing the character of Sunshine. With PEP.ph bringing up this topic, Sunshine recalls, "Yes, I was very sick at that time. So, parang we just opted na lang to... that was the time when I had so much... my migraine was uncontrollable. "I think it was a hormonal thing. But at that time, parang nobody could understand, parang feeling nila, nagdadahilan ka lang. "Pero, fortunately, when I got pregnant, ngayon, manageable naman na and lesser attacks." Sunshine believes the reason for her migraines then was stress from work, when she used to do three to four shows airing in the same period. This started in late 2005, when she was in the prime-time fantasy series, Encantadia, and the afternoon drama, Now and Forever: Agos. She recalls, "Parang feeling ko, noong panahon na yun, I was really overworked. "Kasi there was a time, I was doing an afternoon drama, I was also doing an evening drama, and then once a week na comedy show, plus I would do pa SOP. "Natutulog ako no'n sa GMA—nobody knew that. I would sleep here in GMA para lang hindi ako ma-late sa Bahay Mo Ba 'To or something. "'Tapos, umuuwi lang kami to get clothes. It was really that bad." That also used to be a trend in the past. Artists would do other TV projects, or even two teleseryes, all at the same time. Sunshine recalls, "Parang they didn't mind if you have, like, three shows, or the whole week napapanuod ka. "Di ba dati? Parang ang joke no'n, 'O, e, di pati color bars, patulan mo na!,' she says, referring to the color bars shown on television when the network goes off the air for the night. However, looking back, Sunshine believes all artists must go through that. Angelu echoes this, saying, "We're fortunate that we went through that." Sunshine adds, "Oo, kasi not everybody... I don't want to sound ungrateful, kumbaga, lahat naman tayo, dumaan doon. "Especially now that kami, after all those years, nakapag-asawa na, may anak na, nandito pa rin. Isn't that a blessing, di ba?" However, production crises are not limited to pregnancies and illnesses. 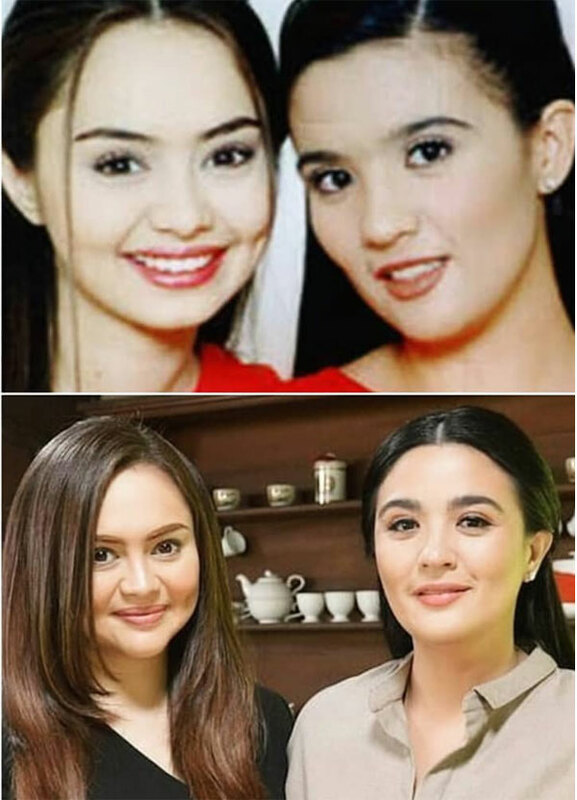 Before Inagaw na Bituin, Sunshine and Angelika's current GMA-7 teleserye, they first worked with each other in the mini-series, Umulan Man O Umaraw, aired in the year 2000. The show's success led to Sunshine and Angelika headlining Ikaw Lang Ang Mamahalin, which aired from 2001 to 2002. It was the Kapuso Network’s first prime-time series under the GMA Telebabad block, and its first attempt at producing a daily series two years after its first foray into solo drama production with Di Ba't Ikaw in 1999. In Ikaw Lang Ang Mamahalin, Sunshine and Angelika played half-sisters Clarissa and Mylene, respectively, who have different fathers. Separated by a tragedy, Mylene went on to have amnesia and began using the name Katherine. They later meet again, but as friends who become rivals. In both Umulan Man o Umaraw and Ikaw Lang Ang Mamahalin, the two actresses engaged in hair-pulling, face-slapping confrontation scenes, with Angelika playing the good girl and Sunshine portraying the kontrabida. Both series were successful, but their celebration did not last long. At one point, while doing Ikaw Lang Ang Mamahalin, Sunshine and Angelika's rivalry became too real, causing them to have issues against each other. Eventually, Sunshine's character was killed in the show. At the time, reports said Sunshine no longer wanted to portray a kontrabida. However, there were also reports that both actresses could not work with each other anymore because of their issues. During this PEP.ph interview, Angelika does not deny that there were conflicts between her and Sunshine at that time. Angelika recalls, "Siyempre, we were young, pressure coming from other people, 'tapos misunderstanding. "Siyempre, bagets kayo, hindi niyo pa naiintindihan." Sunshine, on the other hand, believes that back then, it was really a "thing" to pit two stars against each other—to bring more noise to the shows they were starring in. "I think, uso naman kasi noong unang panahon yun na paniwalain yung mga tao na may rift. "It adds flavor to the kyeme, di ba? Parang you pit one to each other, para may something, uso dati yun." While there was some truth behind their rivalry 17 years ago, Sunshine and Angelika reveal the real reason Sunshine left the show. Angelika recalls, "Alam ko kasi, bago siya patayin, naka-peg na yung Kung Mawawala Ka, since established na yung rating ng Ikaw Lang." Kung Mawawala Ka was the follow-up show of Sunshine after her character was killed in Ikaw Lang Ang Mamahalin. In that politically themed show, she played Rosa Camilla, the kind-hearted, youngest daughter of Leandro Montemayor, played by Eddie Garcia. It was the third series produced by GMA-7 under its Telebabad block. Angelika continues, "At saka pa-book two na, pa-book two na yung Ikaw Lang, e. Kumbaga, parang yung book one, nasagad na, parang one year something-something na yun, e, na book one na puro kami lang, puro bangayan-bangayan, di ba? "So noong dumating ata, pagkakatanda ko, ha, yung Kung Mawawala Ka, doon siya lumipat. "Tapos yung Ikaw Lang, binook two na siya. Naging story na lang ni Katherine, and the usual, nagka-amnesia. Naging sa probinsya na yung kwento." Sunshine makes some corrections to Angelika's memories. Sunshine says, "Actually, I think I was pulled out of the show kasi VIVA ako noon, e.
"VIVA ako noon, kay Tita Veana Fores pa ako no'n, I was only allowed to do 13 episodes. "And then, after that show, I think na-pirate na ako ng Channel 7. "But, ang story talaga noon, I was only allowed to do 13 episodes." Veana Fores, with VIVA Artists Agency, was Sunshine's manager back then. Sunshine also corrects the assumption that her reason for leaving the show was all because of Angelika. "Hindi naman, at saka kasi, dati kasi, may choice ka pag ayaw mo nang mag-renew. "I think ako yung rason no'n—seriously! I think ako yung isa sa mga rason no'n, kaya meron nang whether you like it or not, ire-renew ka nila. "Dati kasi, ganun talaga, they'll just give you an extension, and then it's up to you if you still want to do it or not. Dati." Sunshine also clarifies other reports written before about her being hesitant to play a kontrabida. Sunshine tells, "Kasi naalala ko, si Tita Veana no'n, actually, part of the reason, kasi ayaw ni Tita Veana na magkontrabida ako. "I mean, we were babies of Tita Veana, she wanted to put us in that pedestal, yung image na dapat ang goal is parang Sharon Cuneta, hindi ka magko-kontrabida, sweet lang yung image. "I got bored. I got bored, honestly. Kasi, I wanted to do roles na may ngipin, out of the box, and all that." Years later, Sunshine and Angelika would make amends with each other, welcoming the possibility of working together again. They eventually shared the same manager, Perry Lansigan, and top-billed three shows in GMA-7: Mundo Mo'y Akin (2013), Ika-6 Na Utos (2017), and at present, Inagaw na Bituin. About this, Angelika says, "Mabuti nga na nalagpasan namin yung stage na yun. It's a good thing. "Kasi, ang ganda ng chemistry namin, sayang. "Kung halimbawang may something kayo, 'tapos you won't be able to work with each other just because may something kayo, sayang. "Kaya masaya ako na nalampasan namin yung stage na yun. Pero, ang tagal na panahon yun." In fact, Kapuso viewers always have nice things to say whenever GMA-7 would tap Sunshine and Angelika for a show together. "Nakakatuwa, siyempre. Chemistry yun, e. Kasi ako, di ako naniniwala na, halimbawa, magaling ka, magaling ako, okay na tayo pag pinagsama tayo. "Hindi, e. Importante pa rin yung chemistry noong dalawang tao." PEP.ph’s Anatomy of a Teleserye 2 series continues with Sunshine, Angelu, and Angelika talking about how TV ratings affect their perspective and performance as actresses. To read the first installment of ANATOMY OF A TELESERYE, click: ANATOMY OF A PINOY TELESERYE: How do ABS-CBN and GMA-7 produce their teleseryes?